Do not use a power washer. Power washers have the potential to lift the vinyl from your vehicle or window. Although hand washing is most highly recommended, brushless car washes are also acceptable for larger decals on vehicles. Thinner lettering should be only hand washed. Use cleaning products that are mild and non-abrasive such as 3M™ Car Wash Soap 39000. When hand washing your car, do not scrub hard at the edges of the vinyl. When washing store windows with decals, be sure to use mild and non-abrasive cleaners and avoid wire scrubbers. If possible, always keep your vehicle stored indoors in a garage. If a garage is not available, consider using a cloth cover or at the very least, parking in the shade during the day. Sun exposure has the potential to fade brightly colored vinyl over time – so the less UV rays that the vinyl comes into contact with, the better. Rear window graphics are always installed on the exterior of the window. The defroster on the inside of the window will melt and damage graphics. Do not use the rear window wiper on the window graphics. The rubbing on the graphics will destroy them. We recommend removing the wiper blade altogether to avoid damaging the graphics. Also, do not use an ice scraper on the windows. 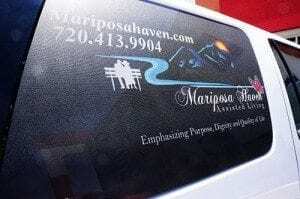 On rear windows of vehicles, we can also provide perforated graphics. These can be a full digital print, while allowing you to see through the window. It is also important to be aware that the perforated vinyl will add another layer of dark tint to the window. 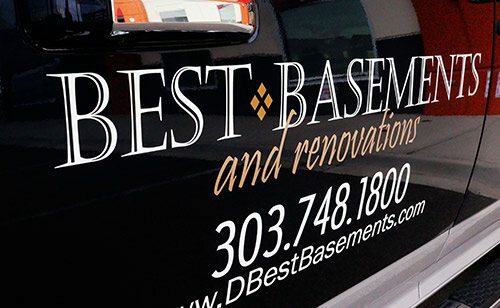 When it does come time to replace or restore your vinyl decals, Signarama of Brighton, Colorado can help you design and create the best vinyl decal for your needs. Contact us to get started.